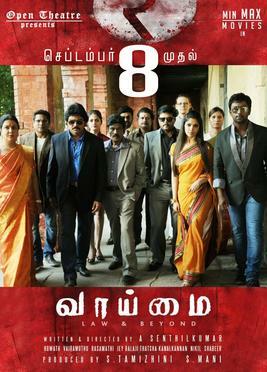 Vaaimai (English : The Truth) is a 2016 Indian Tamil language courtroom drama film written and directed by A. Senthil Kumar. Inspired by the script of Reginald Rose's Twelve Angry Men (1954), the film features Shanthnu Bhagyaraj and Muktha Bhanu in Read More.. Description Vaaimai (English : The Truth) is a 2016 Indian Tamil language courtroom drama film written and directed by A. Senthil Kumar. Inspired by the script of Reginald Rose's Twelve Angry Men (1954), the film features Shanthnu Bhagyaraj and Muktha Bhanu in the lead roles amongst an ensemble cast. Goundamani, Thyagarajan, Ramki, Urvashi, Manoj K. Bharathi, Prithvi Pandiarajan and Poornima Bhagyaraj are also part of the cast. Though production had begun in 2013, the film released following a production delay on 8 September 2016, garnering negative reviews. Vaaimai (English : The Truth) is a 2016 Indian Tamil language courtroom drama film written and directed by A. Senthil Kumar. Inspired by the script of Reginald Rose's Twelve Angry Men (1954), the film features Shanthnu Bhagyaraj and Muktha Bhanu in the lead roles amongst an ensemble cast. Goundamani, Thyagarajan, Ramki, Urvashi, Manoj K. Bharathi, Prithvi Pandiarajan and Poornima Bhagyaraj are also part of the cast. Though production had begun in 2013, the film released following a production delay on 8 September 2016, garnering negative reviews. No reviews available for #Vaaimai, Do you know Vaaimai?, Please add your review and spread the good things.